An article from yesterday in MaltaToday by Jurgen Balzan reports that Italian authorities are not sharing information with Frontex regarding the number of migrants and asylum seekers rescued at sea in the Central Mediterranean and suggests that the withholding of information may be related to an effort to minimize public concerns over migration as Italy nears a vote next month on a constitutional referendum supported by PM Renzi. 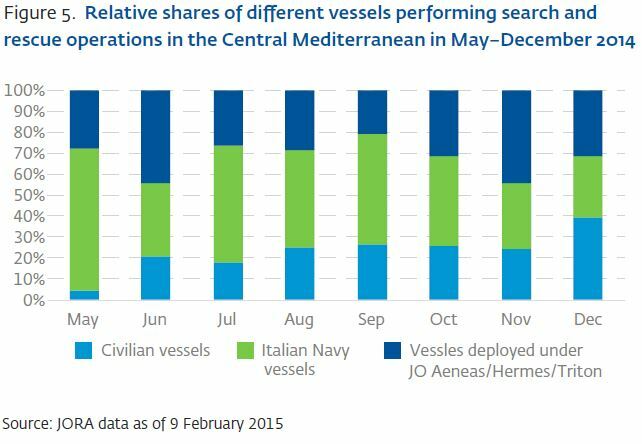 WikiLeaks yesterday released the ‘EUNAVFOR MED Op SOPHIA – Six Monthly Report’. (Also available here: EEAS-2016-126.) The 22 page document is classified as EU RESTRICTED and provides a detailed description of EUNAVFOR MED’s operations during the period 22 June-31 December 2015 and discusses the next steps for the operation, including the move to Phase 2B which would entail operations within Libyan territorial waters. The operation currently operates outside of Libyan territorial waters consistent with UN Security Council Resolution 2259 (2015). The report is signed by Rear Admiral Enrico CREDENDINO, EUNAVFOR MED Op SOPHIA Operation Commander. …Wooden boats are mainly used for migrant smuggling to the west of Tripoli, and rubber boats are more common to the east of Tripoli. Wooden boats are more valuable than rubber dinghies because they can carry more people, hence more profit for smugglers and are more resilient to bad weather and can be re-used if recovered by smugglers. However, following operation SOPHIA entering into Phase 2A (High Seas), smugglers can no longer recover smuggling vessels on the High seas, effectively rendering them a less economic option for the smuggling business and thereby hampering it. 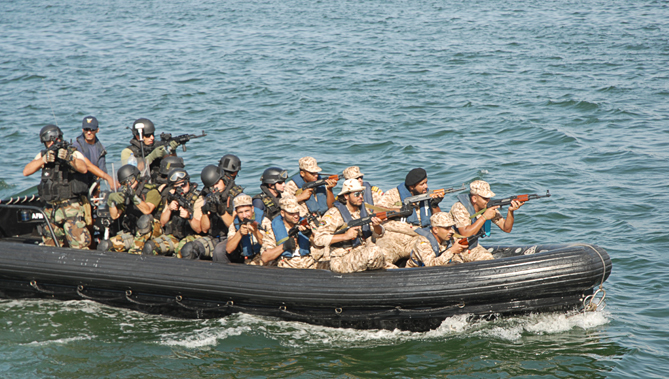 Inflatable boats are used in two thirds of the cases and wooden boats in one third of the cases. According to intelligence sources, the wooden boats used are purchased from Libyan fishermen or imported from Tunisia and Egypt. EUNAVFOR MED are monitoring, within capabilities, the supply routes for these, but no detection has been obtained to confirm beyond any reasonable doubt this supply method. Reports of rubber boast being imported from China and transhipped in Malta and Turkey are supported by a recent interception by Maltese customs of 20 packaged rubber boats in a container destined for Misratah, Libya. As there are no legal grounds for holding such shipments, it was released for delivery to the destination…. …The legal basis applicable to phase 2A (High Seas) relies on the international law applicable to the Operation (UN Convention on the Law of the Sea, Palermo protocol against the smuggling of migrants by land and sea) and on individual Member States’ application of the EU mandate through domestic legislation to board, seize and divert vessels and to detain suspected smugglers and traffickers. The adoption of UNSCR 2240 (2015) by the UN Security Council on 9 October, reinforces the legal framework applicable to EUNAVFOR MED activities in international waters. The resolution now provides the legal basis for all Member States to undertake these activities against suspected smugglers and traffickers coming from Libya…. …In particular we have embedded the training initially provided by UNHCR on migrant handling and international law and this is now a core part of the inchop [command zone] package for new units joining the operation. We are further building on this training with input from UNICEF…. …Entry into Libyan Territorial Waters will undoubtedly allow us to achieve further success as we get towards the heart of [smuggler and trafficker] networks…. …From a military perspective, EUNAVFOR MED is ready to proceed to Phase 2B (Territorial Waters), though the political and legal challenges ahead remain a significant challenge…. …Transition from phase 2A to 2B [Libyan Territorial Waters] will require for a number of significant challenges to be resolved before I can actually recommend the transition. As we will be operating in Libyan Territorial Waters, the current legal finish, of prosecuting suspected smugglers in Italy will not apply. We will therefore need a new legal basis; either an agreement with the Libyan authorities that they will waive their right to prosecute suspected smugglers in Libya and allow them to be prosecuted by another Member State, or to have a transfer agreement in place for apprehended smugglers to be transferred to the Libyan authorities for prosecution. Both options have specific challenges end rely on the consent of the Libyan authorities. If we were to transfer suspected persons to the Libyan authorities, we would need to ensure that they are treated in accordance with human rights standards that are acceptable to the EU and Member States…. …Regardless of the challenges with both options, we are working very closely with the EEAS to come to a workable solution. It is however clear that regardless of the solution taken, the Libyan authorities are fundamental in making this happen, either by providing the agreement to prosecute in another country, or to agree to prosecute in Libya through a judicial system which meets those standards required by the EU. I want to underline the fact that this issue must be solved before we can move to phase 2 Bravo. Without the required legal finish we will be compelled to release suspected smugglers apprehended in Libyan Territorial Waters, with a subsequent loss of credibility for the operation in the media and EU public opinion. Legal mandate – UNSCR and Libyan Invitation. In order to move to phase 2 in Libyan territorial waters, we need firstly an invitation from the GNA, as the sole legitimate Government of Libya under UNSCR 2259(2015), and secondly a UN Security Council Resolution to provide the necessary legal mandate to operate. Whilst the transition to phase 2 in Libyan TTW with only a UNSCR without an invitation from the Libyan authorities is theoretically possible, it is unlikely that the UNSCR would be adopted as Russia and China have previously stated that a Libyan invitation would be required by them so as not to block the resolution…. As we move into Territorial Waters, our interaction with the Libyan Navy and Coastguard will increase and we will need to gain confidence in their activities. The capability and capacity of the Libyan Coastguard to protect their borders needs to be developed and therefore preventing illegal migration from Libyan shores, so that we can reach the end state of the mission where illegal migration is at a manageable level without the need for EUNAVFOR Med. This will have to be shaped with Libyan authorities to match their expectations and could benefit from cooperation with other EU missions…. Full document is here or click on this link EEAS-2016-126. Frontex released its Annual Risk Analysis 2015 (also here) on 28 April. Over the next few days I will post some key points and excerpts from portions of the 70 page report which are most relevant to migration by sea. See Executive Summary and Statistical Annex. • Detections of illegal border-crossing on the Black Sea were extremely rare. However, since 2013, Bulgaria and Romania have reported an increasing number of detections, totalling 433 migrants in 2014. Indeed, Syrians alone (79 169) represented more than a quarter (28%) of the total as shown in Figure 3. [SEE BELOW.] They were also the top nationality for other indicators, in particular asylum applications, reflecting the dire situation in Syria and the desperate plight of Syrian asylum seekers. However, the vast majority of Syrians did not apply for asylum in the Member States of entry but rather in other Member States for many different reasons, notably because they expect to receive more attractive welfare benefits. 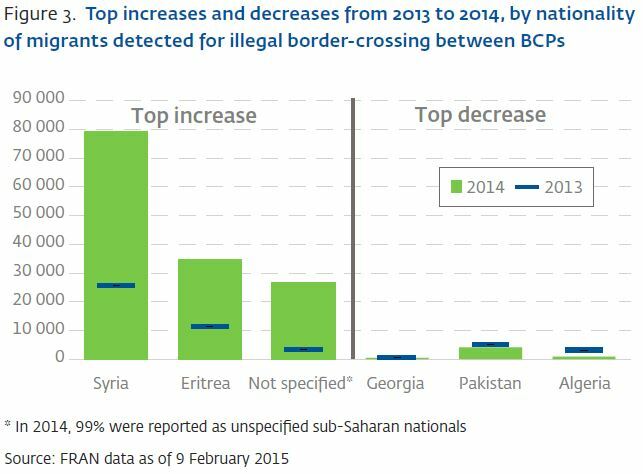 Regarding Eritreans, their detections in 2014 reached a record level (more than 34 500, compared to 11 300 in 2013). They were mostly arriving through Libya on the Central Mediterranean route. Like Syrians, they did not apply for asylum in the Member States of entry, but rather continued to other Member States. Many of the Eritreans stated that they had lived for some time in Libya but decided to leave because of the violence. In 2014, more than 170 000 migrants arrived irregularly in the EU through the Central Mediterranean route (see Fig. 4). [SEE BELOW.] As in 2013 and in 2011, the Central Mediterranean route was the main area for illegal border-crossing into the EU, representing 60% of all detections in 2014. Detections were the largest between June and September at over 20 000 per month, but throughout the year, monthly detections were larger than in 2013. Most migrants were Syrians and Eritreans departing from the Libyan coast. The vast majority were rescued by border-control authorities after issuing a distress call; however, despite best efforts there were many fatalities. Smugglers typically make use of frail, overcrowded boats, with limited fuel available to maximise their profits, putting migrants’ lives at considerable risk. The role of the Italian Navy and the JO Hermes/ Triton was crucial in rescuing an unprecedented number of migrants. Despite these efforts, around 3 400 people died or went missing at sea in 2014 and around 2 800 since the beginning of July according to UNHCR estimates. Besides naval assets, civilian vessels have been increasingly involved in the detection and rescue of migrants at sea (see Fig. 5). [SEE BELOW.] According to the International Maritime Organization (IMO), more than 600 merchant ships have been diverted from their routes to rescue persons at sea in 2014. These deviations are, in the words of the Secretary General, detrimental to shipping and are not offset by any realistic prospects of salvage awards. In addition to migrants leaving from Libya, since September 2014, an increasing number of cases have been reported of cargo vessels being used to smuggle migrants from Turkey directly to Italy. This new trend affects the Eastern Mediterranean route, as the departure area, and the Central Mediterranean area, as the arrival area. This practice is further developed under the section related to the Eastern Mediterranean route. Since data collection began in early 2008, the Eastern Mediterranean has maintained its status as a hotspot of irregular migration (see Fig. 6). In 2014, 50 800 detections were reported from the area, representing 18% of the EU total. This was twice as many as in 2013, mostly due to a sharp increase in detections in the Aegean Sea (from 11 829 in 2013 to 43 377 in 2014). Detections remained comparatively much lower at the Bulgarian and Greek land borders with Turkey (12 262 in 2013 and 5 938 in 2014). Compared to the previous year, the sharp increase in the Aegean Sea in 2014 meant that migrants departed from more areas, and also arrived on a larger number of islands. While the islands reporting the largest number of arrivals remained Lesbos, Chios and Samos, detections were also reported from small islands from North to South, stretching capacity of surveillance. Many migrants claimed to be Syrian, and were thus handed an administrative notice allowing them to stay in Greece for up to six months, even without applying for asylum. Since August 2014 the number of irregular migrants arriving in the Central Mediterranean from Turkey sharply increased compared to earlier in the year and to the same period in 2013. This sharp increase was directly related to the use of cargo ships to facilitate migrants and asylum seekers from Turkey to Italy (for example, see Fig. 7). To date, Mersin has been the place where those wishing to travel to the EU in an irregular fashion have made contact with the smuggling networks. Wooden boats, however, have departed from various points along south-eastern Turkish coast such as Mersin, Adana and Hatay provinces to reach cargo vessels waiting off shore. Smuggling migrants from Turkey on board large cargo vessels is extremely profitable, and such funds are likely to be an important source of income for smuggling networks also engaged in other criminal activities. This means that the criminal networks might be financing other criminal activities by exploiting and putting at risk vulnerable groups of displaced families from Syria. Specifically, the cargo ships, which are often bought as scrap, tend to cost between EUR 150 000 and 400 000. There are often as many as 200–800 migrants on board, each paying EUR 4 500–6 000 for the trip, either in cash a few days before the departure or by Hawala payment after reaching the Italian coast. The cost is high because the modus operandi is viewed as being safe and has been demonstrated as being successful. In 2014 there were 7 842 detections of illegal border-crossing in the Western Mediterranean region, which consists of several areas of the southern Spanish coast and the land borders of Ceuta and Melilla. This total shows an increase of 15% compared to the total of 6 838 reported in 2013. Like in 2013, the first half of 2014 showed most detections being reported at the land border, mostly from Melilla. Indeed, the Spanish authorities reported several violent attempts to cross the fence. As mitigating measures, the fence has been upgraded. 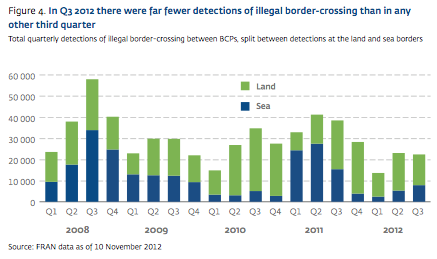 As a result, in the second half of the year, Spain reported more detections at the sea border than at the land border. Once in Melilla, migrants are turned over to Spanish Police Headquarters for identification, and many are transferred to the Temporary Centre for Immigrants (CETI – Centro de Estancia Temporal de Inmigrantes). However, this centre only has a limited capacity and some migrants had to be transferred to mainland Spain. In terms of nationality, most of the migrants are from Western Africa, in particular from Cameroon and Mali. Algerians and Moroccans have also been reported among the top ten nationalities, but mostly at the sea border. Since November 2014, Spain also reported an increase in detections of illegal border-crossing of Syrians at the land border (more than 250 in November and December), then applying for asylum. This increase, combining with increasing detections of Syrians using forged document to enter to the EU, has prompted Spain to open asylum and international protection offices at the borders of Ceuta and Melilla in March 2015. Detections of illegal border-crossing on the Black Sea were extremely rare. However, since 2013, Bulgaria and Romania have reported an increasing number of detections, totalling 433 migrants in 2014. The political and security situation in Libya is complicated. And while migrant boats tend to depart from areas around Tripoli because the area is closer to Lampedusa and Malta, boats leave from eastern areas of Libya as well. If the EU does end up taking military action in Libya, it will necessarily engage with different militias and political groups. Libya Situation Map mid-April 2015 – Map by @arabthomness. The EP’s Directorate-General for External Policies just released an Analysis, “Mediterranean flows into Europe: Migration and the EU’s foreign policy,” in which it reviews the EU’s external policies and instruments relating to migration in the Mediterranean, including the Mediterranean Task Force established after 3 October 2013 tragedy at Lampedusa in which over 350 people died. All should incorporate respect for human rights as a central concern and pursue the overall goals of prevention, protection and solidarity. The EP has tools at hand to contribute effectively to those objectives. The EP should use its co-decision powers to ensure the inclusion of human rights provisions in all migration-related legislation, and its power of consent to guarantee that international agreements contain effective human rights guarantees. The EP’s budgetary powers also allow the institution to link assistance to third countries to proper human rights monitoring mechanisms. Most pressingly, the EP should advocate the implementation of the actions recommended by the Mediterranean Task Force set up by the Commission. The EP should also use the opportunities generated by inter-parliamentary relations (such as the 27th ACP-EU Joint Parliamentary Assembly in March and the EU-Africa summit in April) to engage in a dialogue about migration with third countries. This dialogue should foster cooperation in the management of regular migration and in the fight against irregular migration and trafficking networks, with special emphasis on the need to prevent migrants from embarking on dangerous journeys to the EU. Steer away from excessively militarised and security-centred approaches. The EP should ensure that strict human rights standards are respected in the fight against organised crime and smugglers’ networks, and that a clear distinction is drawn between criminal networks and their victims. The EU should prevent the criminalisation of migrants and of humanitarian organisations supporting migrants. Highlight the importance of good governance, and of good migration governance more specifically. By reinforcing the EU’s Regional Development and Protection Programmes, for example, the Union can develop a comprehensive and long-term framework to develop and enhance the capacities of migration management and national asylum systems in Mediterranean countries. Demand full respect for humanitarian law, refugee protection and human rights (including the rights of non-nationals) in crisis situations, and stress that humanitarian access must be guaranteed to provide life-saving supplies. Recognise the importance and challenges that South-South and intra-African migration represent for countries in the southern Mediterranean, rather than focussing solely on the (much smaller) flows towards the EU. Encourage further research on the migration-development nexus and explore the positive impact of human mobility on socioeconomic development. Encourage EU Member States to facilitate and speed up their procedures to grant asylum and EU protected status, whilst better differentiating between refugees and irregular migrants. The EP should respect the competence of the Member States in this regard, but could also encourage Member States – in cooperation with the UNHCR – to increase their quotas for resettling refugees not adequately protected in third countries. The EP should support the Mediterranean Task Force’s proposed feasibility study on the joint processing of protection claims outside the EU, and the Commission’s proposal to move towards a common approach for humanitarian permits and visas. Click here or here for the Analysis. Click here or here for Statewatch Analysis. As you may recall, the earlier version of the Frontex Sea Borders Rule in the form of a Decision was adopted by the European Council in 2010 (Decision 2010/252/EU). The Decision was subsequently annulled by the Court of Justice of the European Union on the ground that it introduced new essential elements into the Schengen Borders Code by way of the provisions on interception, rescue and disembarkation and that such substantive changes required the consideration and approval of the European Parliament. (European Parliament v Council of the European Union, Case C-355/10, 5 Sept. 2012). The proposed replacement for the annulled Decision is in the form of a Regulation but is fairly similar in content. the presence of pregnant women or children. The objections by the six states to Art. 10 regarding places of disembarkation are most likely due to the states’ conflicting positions regarding where disembarkation should occur. While Art. 10 creates a procedure for decisions regarding places of disembarkation to be made by participating member states in advance of joint operations, its provisions identify circumstances under which disembarkation in member state may occur when that state is not participating in the joint operation. Malta and Italy in particular have long disagreed on where disembarkations are to occur. This long standing disagreement obviously contradicts the claims made by the six opposing states that existing international laws already deal “amply” with the disembarkation issue. Click here for ANSA article. In January of this year, the Frontex Risk Analysis Unit (RAU) released its 2012 Third Quarter Report (July – September 2012). (Frontex has since released Reports for Q4 2012 and Q1 2013; we will post summaries of these more recent Reports shortly.) As in past quarters, the 70-page report provided in-depth information about irregular migration patterns at the EU external borders. The report is based on data provided by 30 Member State border-control authorities, and presents results of statistical analysis of quarterly variations in eight irregular migration indicators and one asylum indicator. 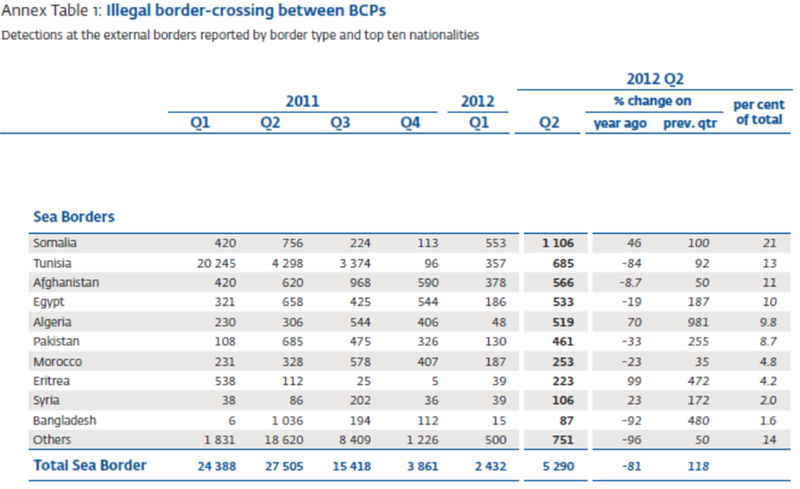 During 2012 Q3 several FRAN indicators varied dramatically compared with previous reports, including a significant reduction in detections of illegal border-crossing compared with previous third quarters. In fact, there were fewer detections of illegal border-crossing than in any third quarter since data collection began in early 2008. Additionally, this quarter reported the largest number of applications for asylum since data collection began in early 2008, with Syrians ranking first among nationalities. “Overall, in Q3 2012 there were fewer detections of illegal border-crossing than in any previous third quarter, following the launch of two Greek Operations: Aspida (Shield), which involved the deployment of ~1 800 Greek police officers to the Greek land border with Turkey, and Xenios Zeus, which focused on the inland apprehension of illegally staying persons. The much-increased surveillance and patrolling activities at the Greek-Turkish land border, combined with the lengthening of the detention period to up to 6 months, resulted in a drastic drop in the number of detections of irregular migrants from ~2 000 during the first week of August to below ten per week in each of the last few weeks of October. Perhaps somewhat predictably, there were increased detections of illegal border-crossing at both the Turkish sea border with Greece and land border with Bulgaria, indicative of weak displacement effects from the operational area…. “Overall, in Q3 2012 there were 22 093 detections of illegal border-crossing at the EU level, which is considerably lower than expected based on detections during previous quarters. In fact, there were fewer detections of illegal border-crossing than in any third quarter since data collection began in early 2008. The particularly low number of detections was due to vastly increased operational activity at the Greek land border with Turkey since 30 July 2012, and also to the overlapping effects of the end of the Arab Spring in its initial countries (Egypt, Libya, Tunisia) and far fewer detections of circular Albanian migrants illegally crossing the border into Greece. 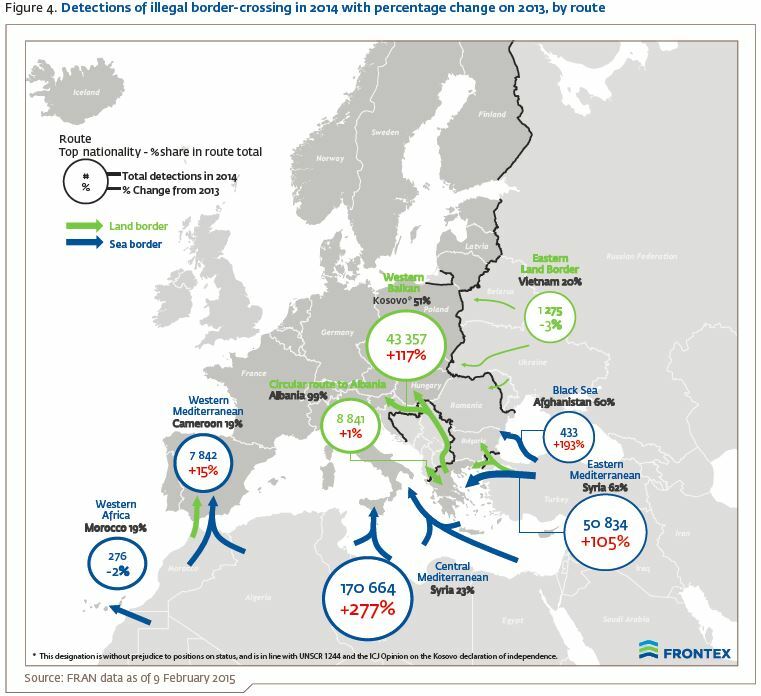 “… As illustrated in Figure 8, in the third quarter of 2012 the most detections of illegal border-crossings were reported on the Eastern and Central Mediterranean routes, which is consistent with the overall trend for most third quarters in the past. However, on the Eastern Mediterranean route the summer peak of detections, which has been remarkably consistent over recent years, was much lower than expected following increased operational activity in the area resulting in far fewer detections during the final month of the quarter. In the Central Mediterranean, increased detections of several nationalities illegally crossing the blue border to Lampedusa and Malta, as well as increased landings in Apulia and Calabria from Greece and Turkey, combined to produce the highest number of detections both before and after the prominent peak reported during the Arab Spring in 2011. Q3 2012. In fact, according to the FRAN data there were more detections in this region than ever before. The most commonly detected migrants were from Afghanistan, which is a significant but steady trend. In contrast detections of migrants from Pakistan, Bangladesh and Syria have increased very sharply since the beginning of 2012. “… According to FRAN data, in Q3 2012 there were just 3 427 reported detections of illegal border-crossing on the main Central Mediterranean route (Italian Pelagic Islands, Sicily and Malta), a significant decrease compared to the same reporting period in 2011. However, this figure was still the highest reported so far in 2012, and was higher than the peak in 2010. Additionally, there were some significant increases in various nationalities. On the Central Mediterranean route, detections of migrants from Tunisia continued to in crease from 82 during the last quarter of 2011 to over 1 000 in Q3 2012. Tunisians were not the only North African nationality to feature in the top five most detected nationalities in the Central Mediterranean region, as Egyptians were also detected in significant and increasing numbers (287). The fact that fewer Egyptians than Tunisians were detected in the Central Mediterranean should be interpreted in light of Egypt being eight times more populous than Tunisia, which shows that irregular migration pressure from Egypt is proportionally much lower than that from Tunisia. Also significant in the Central Mediterranean during the third quarter of 2012 were detections of Somalis (854) and, following recent increases, also Eritreans (411). Somalis have been detected in similarly high numbers during previous reporting periods (for example over 1 000 in Q2 2012) but there were more Eritreans detected in Q3 2012 than ever before. “In 2011, irregular migration in the Western Mediterranean region increased steadily from just 890 detections in Q1 2011 to 3 568 detections in the third quarter of the year. A year later in Q3 2012, detections dropped to just over 2 000 detections, which was, nevertheless, the highest level so far in 2012.
and at the land border with Morocco, the migrants of unknown nationality were mostly reported from the land borders. Spanish sea border and extending into the Western Mediterranean. In Q3 2012, there were far fewer Moroccan nationals detected (79) compared to Q3 2011. Most were detected just east of the Gibraltar Strait, between Tangiers and Ceuta. According to the migrants’ statements, the area between Ksar Sghir and Sidi Kankouche is the most popular departing area among Moroccans who want to cross the Gibraltar strait (10.15 NM distance). The boats used for the sea crossing were toy boats bought by the migrants in a supermarket for EUR ~100…. “In the third quarter of 2012, there were just 40 detections of illegal border-crossing in this region, almost exclusively of Moroccan nationals but with an influx of Senegalese nationals…. 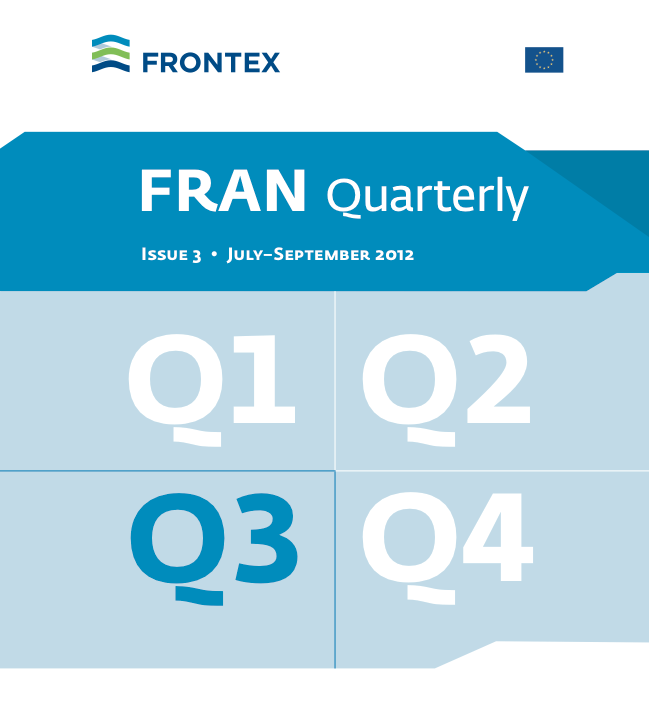 Click here or here here for Frontex FRAN Report for Q3 2012. Click here for previous post summarizing Frontex FRAN Report for Q2 2012. The Italian news agency AGI reported that Italian search and rescue authorities yesterday diverted two commercial ships, the Patroclus, a Maltese oil tanker, and the Cdry White, an Italian cargo ship, to assist with the rescue of two groups of migrants. The first group of approximately 76 migrants was rescued about 40 miles from Tripoli by an Italian coastguard vessel; the group was then transferred to the Cdry White. The Patroclus appears to have directly rescued a group of approximately 97 migrants south of Lampedusa. AGI reported that the two commercial ships are sailing to Trapani and Pozzallo in Sicily to disembark the rescued migrants. Just over a week ago Italian search and rescue authorities directed two commercial ships, an oil tanker and a cargo ship, to rescue two groups of migrants in distress off the Libyan coast. After taking the migrants on board, both ships were ordered to transport the migrants to Libya. One ship’s captain complied with the order and 96 migrants were turned over to Libyan authorities; the other captain refused and a several day stand-off between Malta and Italy resulted before Italy agreed to allow the migrants to be disembarked on Italian territory (see Malta Today: Malta blocks rescue ship from entering Malta waters; Malta orders ship to sail to Libya; Conditions on rescue ship worsen). The incident involving the two ships was by no means rare and what transpired raises a host of important issue. It is obviously good that one ship was permitted to disembark the rescued migrants on Italian territory. But what transpired with the second ship that returned the rescued migrants to Libya is extremely problematic and amounted to a push-back. Neither Italy nor Malta should be able to evade their responsibilities to consider asylum claims by ordering commercial ships to engage in rescue operations and then issuing orders to those commercial ships to return potential asylum seekers to a country such as Libya which is not a signatory to the Refugee Convention. Was the captain of the Salamis right? We asked Prof. Niels Frenzen about the legal implications of commercial ships effecting the rescue of migrants at sea on behalf of coastal states. One week ago Italian search and rescue authorities directed two commercial ships, the Liberian-flagged oil tanker Salamis and the Turkish cargo ship Adakent, to divert from their courses to rescue two groups of migrants in distress off the Libyan coast. Rescues like this take place almost daily, though most are conducted by national armed forces or coastguards. Rescue operations conducted by commercial vessels raise different legal issues, one of the most important and problematic being where are the rescued persons to be disembarked. And while disputes periodically arise between Italy and Malta when patrol boats belonging to the armed forces of one country have sought to disembark rescued persons in the other country – usually due to disagreement as to where the closest safe port is located in relation to the place of rescue – at the end of the day if the stand-off is not resolved, an AFM or Guardia di Finanza patrol boat is always able to disembark rescued survivors in their respective home ports. This is not the case when commercial ships rescue survivors as was demonstrated by Malta’s decision not to permit the Salamis to enter Maltese waters for the purpose of disembarking the 102 rescued migrants. Some government officials characterised the initial decision of the captain of the Salamis to attempt to disembark the rescued migrants in Malta as a violation of international law. Such an assertion is inaccurate and fails to take into consideration the complicated framework of different international laws – search and rescue, human rights, and refugee – which come in to play when migrants are rescued or otherwise encountered in international waters, particularly when it is likely that there are asylum seekers or other persons in need of protection among the rescued persons. While Malta’s decision to bar the Salamis attracted significantly more international media attention than the events pertaining to the Adakent, these two incidents and the different resolutions highlight important legal issues. After the two ships rescued and took on board the different groups of migrants, Italian authorities instructed both ships to disembark the rescued migrants in Libya because the migrants had departed from Libya. The Adakent sailed to Tripoli – its planned destination before the rescue – and turned 96 rescued migrants over to Libyan authorities. The captain of the Salamis disregarded Italy and Malta’s orders to sail to Libya and continued to sail towards Malta – its planned destination before the rescue. Both ship captains properly carried out their clear legal obligation under international law to rescue the stranded migrants. The more difficult legal question is where should the rescued persons be taken once rescue operations are completed. While international law does not explicitly answer the question, it does impose the obligation on a ship’s captain to disembark persons only in “a place of safety.” Since the 102 migrants rescued by the Salamis included Eritreans and Ethiopians it is clear that many of them were asylum seekers and therefore the captain was legally obligated to ignore the Italian and Maltese orders that the migrants be returned to Libya. Assuming some or all of the 96 migrants rescued by the Adakent were also asylum seekers, the Adakent’s captain likewise should have disregarded Italian instructions to return the migrants to Libya. Both the UNHCR and the International Maritime Organization (IMO) have issued guidelines to ship captains addressing the situations faced by the Salamis and Adakent. The guidelines are based on the Search and Rescue Convention and the Refugee Convention and provide that if there is some reason to believe that a rescued person is an asylum seeker, the captain is obligated to take that fact into consideration when making a decision as to where to disembark the survivor. Malta and Italy are well aware that many if not most migrants departing Libya by boat are asylum seekers and are also aware that many of the asylum claims will be granted if the asylum seeker is successful in lodging an application. Had these two rescues been carried out by AFM or Guardia di Finanza patrol boats rather than the two commercial ships, the patrol boats would have been under a clear legal obligation to disembark the rescued migrants in a location where asylum or other claims for international protection could be properly considered. The 2012 decision in the Hirsi v Italy case by the European Court of Human Rights condemned the Italian push-back practice which resulted in asylum seekers being returned to Libya without being given an opportunity to make asylum claims. Neither Italy nor Malta can evade their responsibilities to consider asylum claims by diverting commercial ships to engage in rescue operations and then issuing orders to those commercial ships to return potential asylum seekers to a country such as Libya which is not a signatory to the Refugee Convention and does not provide an adequate alternate procedure to consider claims for protection. There can be honest disagreement about where rescued migrants are to be disembarked as long as the survivors will be safe and protected when disembarked. The Search and Rescue Convention obligates countries to coordinate and cooperate among themselves to permit rescuing ships to disembark rescued persons. Malta and Italy as sovereign countries have the right to control their borders, but this sovereign power has to be applied in manner that is consistent with international human rights and refugee law by which they have agreed to be bound. [M]igrants from Algeria were not only increasingly detected at the Greek land bor[d]er with Turkey, but also in the Spanish maritime region of Almeria and at the Romanian land border with Serbia.The latter case is assumed to represent secondary movements through the Western Balkans region. In 2011, detections of illegal border-crossing on the Central Mediterranean route peaked briefly during the period of turbulent sociopolitical developments in North Africa, known as the Arab Spring. In contrast, on the Eastern Mediterranean route, detections have followed a remarkably seasonal pattern over the last two years. 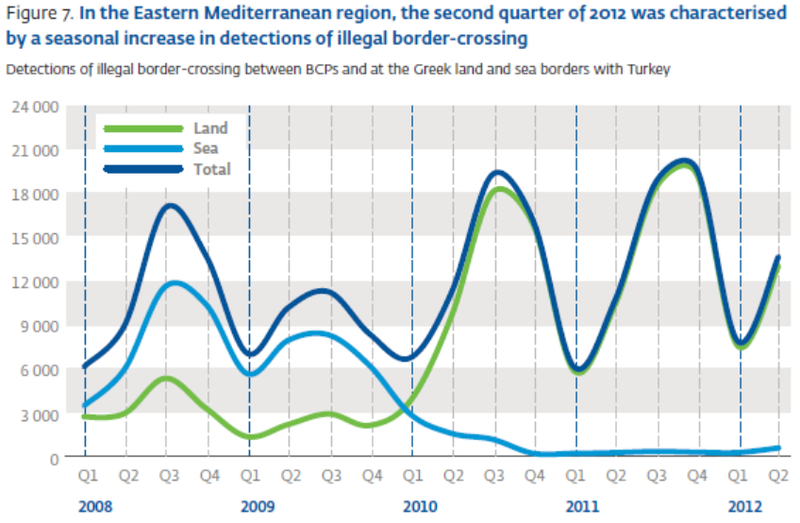 Throughout 2011 detections in the Western Mediterranean (land and sea borders with Spain) steadily increased. 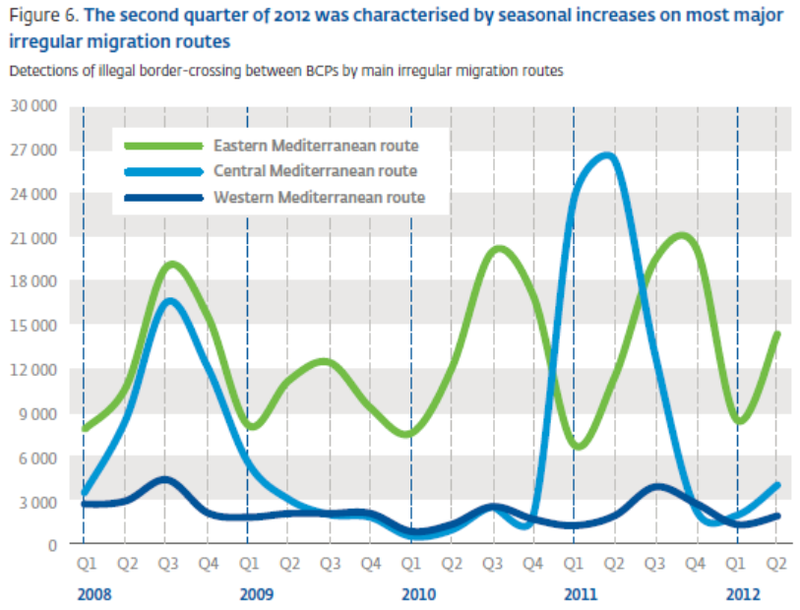 As illustrated in Figure 6, the Eastern and Central Mediterranean routes reported the most detections of illegal border-crossing in the second quarter of 2012, and were characterized with seasonal increases consistent with previous years, aside the Central Mediterranean region during the Arab Spring. Western Mediterranean were almost equally comparable to Q2 2011, whereas detections increased to a large degree, yet from lower bases, on the Eastern Borders route (+103%), Western Balkans route (+50%) and Western African route (+29%). [T]he Western Mediterranean route was apparently dominated by local migrants from Morocco and Algeria but with large numbers of unknown nationalities it is assumed that local migrants are also accompanied by other long-distance migrants probably from sub-Saharan Africa. The exception was the much less used Western African route, which was exclusively affected by local migrants from Morocco. Italian Ionian Coast: For some time there has been a steady flow of Afghans and, to a lesser extent, Pakistanis arriving in the Southern Italian blue borders of Calabria and Apulia with some increases during Q2 2012. Subsequent to the reporting period (July 2012), JO EPN Aeneas 2012 was launched and is currently scheduled to run until the end of October 2012. There are two operational areas, Apulia and Calabria, covering the seashore along the Ionian Sea and part of the Adriatic Sea. According to Croatian open sources* in July, some 65 Asian and African migrants presumed to be heading to Italy were found drifting some 47 nautical miles south of Dubrovnik due to a broken engine (Fig. 12). They had been drifting for two days. The migrants, who had departed from Greece, did not want to be rescued by the Croatian authorities as they wanted to go to Italy. After several hours of negotiations, the authority for search and rescue towed the sailing boat to the nearest Croatian port. Irregular migration in the Central Mediterranean massively fluctuated in size and composition during 2011, largely due to the political and civil unrest across North Africa, particularly in Tunisia and Libya. Since Q4 2011, the situation has significantly improved following better cooperation between Italian and Tunisian authorities concerning the return of Tunisian nationals. 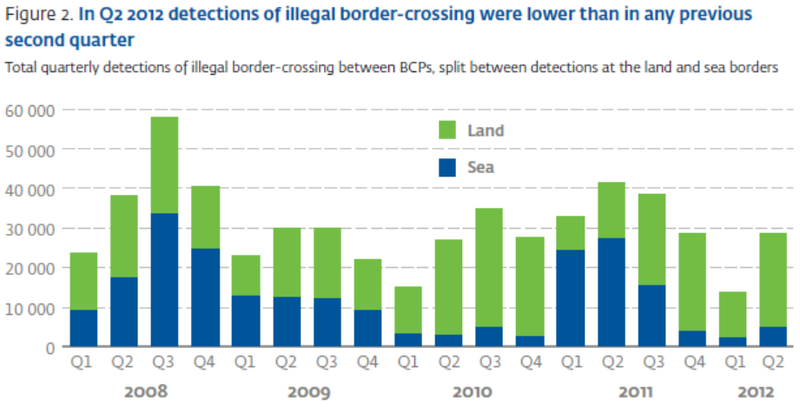 According to FRAN data, in Q2 2012 there were just 3 685 reported detections of illegal border-crossing on the Central Mediterranean route, a massive decrease compared to the peak in last year in Q2 2011 but an increase compared to late 2011 and early 2012. The increase was almost entirely due to more detections of migrants from Somalia (1 094) combined with a steady stream of migrants still arriving from Tunisia. Several nationalities previously detected in high numbers particularly in 2011 were not detected in significant numbers, including Bangladeshis (72) and Nigerians (19). Italy registered a decrease in the number of Somali migrants apprehended in Sicily and the Pelagic Islands. In most cases, groups of males, females and minors (or families) were found on board rubber dinghies with outboard motors. A few of the boats were detected in Italian territorial waters in some distress after the migrants had called the Italian authorities for help using satellite telephones. The boats that recently headed for Malta were either intercepted by Maltese patrol boats or made it to the island without being intercepted. Detected Somalis were mainly young males (aged 18–24) with secondary education and low or no income. The main reason for the migration was socio-economic, but in some cases it was military conflict. In Q2 2012, there were no Joint Operations running in the Central Mediterranean Sea, therefore Frontex and the FRAN community are unable to utilize intelligence obtained through the direct debriefing of migrants. However, valuable information has been obtained from interviews carried out by the Maltese authorities. Such preliminary interviews revealed that some of the Somali migrants arriving in Malta had been promised that they would be brought to Italy. They departed from an unknown location in Libya and travelled for up to three days in boats before either being intercepted by Maltese authorities or reaching the shore. The average fare was said to be around USD 1 000 per person. Migrants from Tunisia – Most Tunisian migrants detected arriving in the Central Mediterranean Region were young (18–35 years) unmarried males with a primary level of education and low previous incomes (EUR 80–180 per month). All interviewed migrants declared to have relatives or friends already in the EU, especially in Italy, and they arrived on boats containing on average 20 migrants (Fig. 13). Throughout the quarter, Italy and Tunisia cooperated efficiently to repatriate Tunisian nationals and so most migrants typically arrived undocumented to delay readmission. Subsequent to the reporting period, JO Hermes 2012 was launched on 2 July and is currently planned to run until 31 October 2012 as a continuation of the deployment of JO Hermes Extension 2011, which ended just before the reporting period, on 31 March 2012. JO Hermes 2012 has been established to support the Italian authorities in tackling maritime irregular migration along the coasts of Sicily, Pantelleria and the Pelagic islands (Lampedusa, Linosa, Lampione). 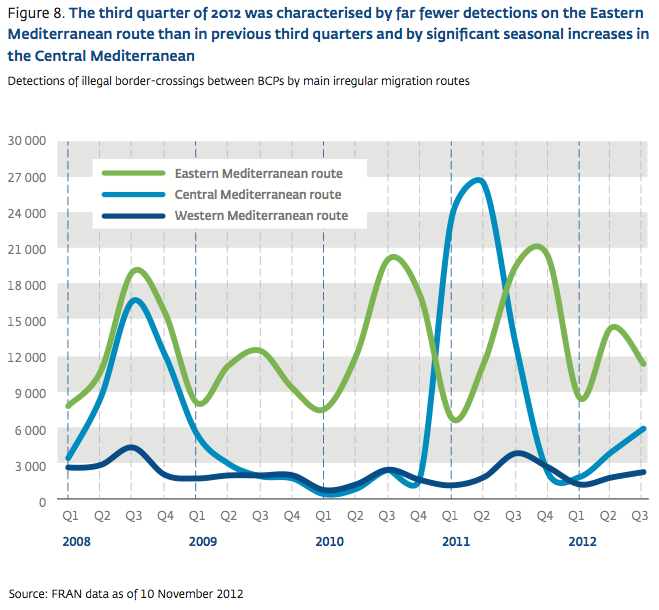 Irregular migration in the Western Mediterranean region increased throughout 2011 from just 890 detections in Q1 2011 to 3 568 detections in Q3. In Q2 2012, there were 1 549 detections which almost exactly corresponds to the number of detections the year before in Q2 2011 (1 569). As was the case a year ago, most detections were of Algerians followed by migrants of unknown nationalities (presumed to be sub-Saharan Africans) and Moroccans. Recently, the size of the sub-Saharan population coming from Algeria has increased in different settlements adjacent to the Melilla border fence. Criminal networks operate more easily in this north eastern region of Morocco and the Spanish authorities treat a large-scale illegal crossing of the fence to the Spanish side as a real possibility. Attempts to cross have been made in the past involving groups of dozens or even hundreds. JO EPN Indalo 2012 started on 16 May and is currently scheduled to run until 31 October 2012. So far the number of irregular migrants apprehended in the operational areas is almost double that of the same period in 2011. Analysis of the information provided by the Spanish authorities also indicates a new increasing trend in the number of Algerian and Moroccan migrants per boat since the beginning of 2012. The improvement of the weather and sea conditions during the reporting period impacted on the number of boats detected, with a gradual increase of the number of arrivals during the peak period, which according to data from the last two years is from May to October. Migrants from Algeria – According to information gathered during interviews, most Algerians were single male adults aged 19–36 on average, but there were also a few females and minors in good health. Most migrants belonged to the lower middle class and, despite having a high level of education compared to sub-Saharan nationals, they suffered from a generalised lack of opportunities, welfare and access to public health services. Nearly all the Algerian migrants spoke Arabic with a few French and English speakers, but all were undocumented to avoid repatriation after arriving in Spain. The majority had relatives or friends in EU Member States, mainly in France and Spain, who could help them to find a job and settle within the ethnic communities already established in these countries. In the second quarter of 2012, there were just 31 detections of illegal border-crossing in this region, almost exclusively of Moroccan nationals. As reported in the previous FRAN Quarterly*, in February 2012 Moroccan and Spanish Ministers of Interior signed a police agreement to create two joint police stations in the Spanish (Algeciras) and Moroccan (Tangiers) territories to cooperate by exchanging operational information and best practices between different police services. The goal of this cooperation is to strengthen the efforts and improve the results against organized crime operating on both sides of the Strait of Gibraltar involved in the smuggling of drugs, international terrorism, irregular migration and trafficking in human beings. Following these developments, both International Police Cooperation Centres became operational during May 2012 (Fig. 14). The International Joint Police Stations are going to be integrated with National Police / Guardia Civil (Spain) and General Direction for National Security (Police) / Royal Gendarmerie (Morocco) staff for a rapid and effective exchange of information. As reported in previous FRAN Quarterlies, the Western African route from the north of Mauritania to the Western Sahara territory is being reopened by illegal migration facilitation networks. It has been inactive for years but recently an estimated 2 000 sub-Saharans (particularly from Senegal) settled in the Western Saharan coastal cities of El Aaioún and Dakhla and in the last few months ~20 000 Senegalese nationals have entered Mauritania along these routes to the north. Click here or here for Report. Human Rights Watch released a briefing paper on 16 August entitled “Hidden Emergency-Migrant deaths in the Mediterranean.” The briefing paper, written by Judith Sunderland, a senior researcher with HRW, reviews recent events in the Mediterranean, provides updates on new developments, including the EUROSUR proposal and IMO guidelines that are under consideration, and makes recommendations for how deaths can be minimized. “The death toll during the first six months of 2012 has reached at least 170. … Unless more is done, it is certain that more will die. Europe has a responsibility to make sure that preventing deaths at sea is at the heart of a coordinated European-wide approach to boat migration, not a self-serving afterthought to policies focused on preventing arrivals or another maneuver by northern member states to shift the burden to southern member states like Italy and Malta. European countries most affected by boat migration—Italy, Malta, Greece and Spain—have saved many lives through rescue operations. But those governments and the European Union as a whole have focused far more effort on seeking to prevent boat migration, including in ways that violate rights. Cooperation agreements with countries of departure for joint maritime patrols, technical and financial assistance for border and immigration control, and expedited readmission of those who manage to set foot on European soil have become commonplace. The EU’s border agency Frontex has become increasingly active through joint maritime operations, some of which have involved coordination with countries of departure outside the EU such as Senegal. Even though in September 2011 the EU gave Frontex an explicit duty to respect human rights in its operations and a role in supporting rescue at sea operations, these operations have as a primary objective to prevent boats from landing on EU member state territories. This has also prevented migrants, including asylum seekers, from availing themselves of procedural rights that apply within EU territory. Italy had suspended its cooperation agreements with Libya in February 2011, and has indicated it will respect the European Court’s ruling and will no longer engage in push-backs. However, past experience suggests that an immigration cooperation agreement signed with the Libyan authorities in April 2012, the exact contents of which have neither been made public nor submitted to parliamentary scrutiny, is unlikely to give migrants’ human rights the attention and focus they need if those rights are to be properly protected. It may be tempting to blame lives lost at sea on unscrupulous smugglers, the weather, or simple, cruel fate. However, many deaths can and should be prevented. UNHCR’s recommendation during the Arab Spring to presume that all overcrowded migrant boats in the Mediterranean need rescue is a good place to start. Recognizing the serious dimensions of the problem, specialized United Nations agencies such as the UNHCR and the International Maritime Organization (IMO), have been working to produce clear recommendations. These include establishing a model framework for cooperation in rescue at sea and standard operating procedures for shipmasters. The latter should include a definition of distress triggering the obligation to provide assistance that takes into account risk factors, such as overcrowding, poor conditions on board, and lack of necessary equipment or expertise. UNHCR has also proposed that countries with refugee resettlement programs set aside a quota for recognized refugees rescued at sea. The IMO has also been pursuing since 2010 a regional agreement among Mediterranean European countries to improve rescue and disembarkation coordination, as well as burden-sharing. The project, if implemented successfully, would serve as a model for other regions. A draft text for a memorandum of understanding is under discussion. Negotiations should be fast-tracked with a view to implementation as quickly as possible. If Europe is serious about saving lives at sea, it also needs to amend the draft legislation creating EUROSUR. This new coordinated surveillance system should spell out clearly the paramount duty to assist boat migrants at sea, and its implementation must be subject to rigorous and impartial monitoring. Arguments that such a focus would create a ‘pull factor’ and encourage more migrants to risk the crossing are spurious. History shows that people on the move, whether for economic or political reasons, are rarely deterred or encouraged by external factors. Click here or here for HRW Briefing Paper. Click here for HRW press statement. Click here, here, and here for articles.